Staging workshop of a new production by Robert Wilson in collaboration with four young directors from the Directors’ Conservatory in Paris. A site-specific project exploring the architecture of body, space, and time created by artist Branka Cvetjicanin and a team of artists from Croatia, with direction by Robert Wilson. Watermill participants created workshops with local school children that culminated in a contemporary adaptation and performance of Alice in Wonderland on the grounds of the Watermill Center. Architectural design workshop for the historic theater in Naples. Design of an exhibition of Robert Wilson’s drawings at Pierre Bergé/Yves Saint Laurent Foundation in Paris. 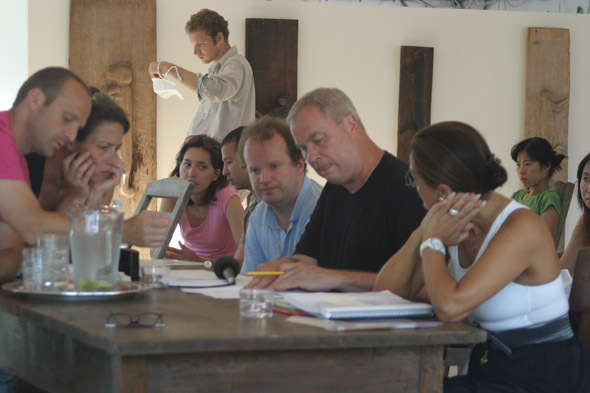 Under the guidance of Robert Wilson and Kenward Elmslie, Watermill directors collaborated with writers from Southampton College to experiment in taking works of new writing from the page to the stage. Watermill participants took part in a design workshop for a revival production of Robert Wilson’s seminal staging of Richard Wagner’s Parsifal, later staged at the Los Angeles Opera. Staging workshop of a new operatic production with a libretto written by Noble Prize-winning Nigerian author Wole Soyinka and original score by Cuban composer Tania Leon. Staging workshop for the Betty Nansen Theater (Copenhagen) production of The Shadow by Hans Christian Andersen with music by Tom Waits. Staging workshop of a new play by Gabriella Ornstein. Summer Program participants took part in a design workshop for a public square in Helsinki in honor of the Finnish design and sculptor, Tapio Wirkkala.